The first artistic collection of photographs documenting William Floyd’s Old Mastic House will be presented by Fire Island National Seashore at the Patchogue Ferry Terminal. The exhibit, The William Floyd Estate Comes to Fire Island, opens on July 4 and remains on view until August 17, 2014. Some of the images are drawn from the collection’s debut at New York City’s Fraunces Tavern Museum when they were exhibited as William Floyd’s House of Revolution. The public is also invited to a free artist reception at the Terminal on Sunday, July 20, from 3:00 pm to 6:00 pm. Light refreshments will be available as well as a free drawing to win a 5″x7″ print from the exhibit that will be signed by the artist. Old Mastic House was the Mastic Beach home of General William Floyd, an American revolutionary and a signer of the Declaration of Independence, who served with George Washington. Floyd escaped to Middletown, Connecticut, during the British occupation of Long Island. After his return seven years later, Floyd restored and enlarged the ransacked house where he entertained Thomas Jefferson and James Madison. Eight generations of Floyds remained until they donated the estate to the National Park Service. Today, the public can enjoy free tours of the 25 room house and explore the surrounding 613 acres of forest, fields, marsh and trails, all of which are a park unit of Fire Island National Seashore. 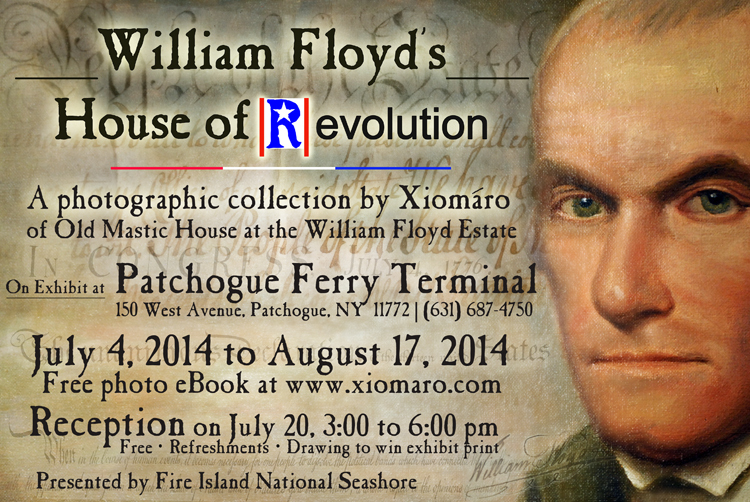 The photographs, created by Long Island artist Xiomáro (see-oh-mah-ro), were commissioned by the National Park Service and present: an introduction to William Floyd through his personal items; the house as a silent witness to the Floyds’ involvement in American wars beyond the Revolution; and a peek into some of the key rooms one can visit during a tour of the house as well as two “secret” locations not open for public view. Seventeen photographs – seven large prints and ten smaller ones – were selected from over 200 images created under the commission to present extremely rare views. Historical artifacts from Old Mastic House will also be on display. Xiomáro is a nationally exhibited artist from Long Island who uses photography to breathe life into iconic American figures and historical sites. His work has been covered by The New York Times, The Huffington Post, Fine Art Connoisseur and News 12 Long Island. He began as an Artist-in-Residence at Weir Farm National Historic Site in Connecticut and continues his relationship there as a Visiting Artist. His other commissions from the National Park Service include: Sagamore Hill National Historic Site, the Oyster Bay home and Summer White House of President Theodore Roosevelt; the farmhouse and studio of Julian Alden Weir, a founder of American Impressionist painting; the studio of Mahonri Young, a sculptor of the Ashcan School; and the Boston Harbor Islands. At present, Xiomáro’s work can be seen at Harvard University and at Stony Brook’s Long Island Museum. For more information and for a free exhibit eBook, visit www.xiomaro.com.